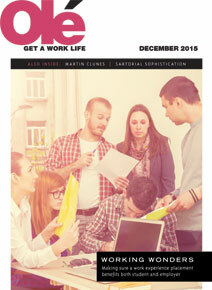 Olé is an office lifestyle blog and monthly magazine for busy people. Watch this space for must-read office and career advice, along with ideas for your lunch, competitions and funny stuff to make your nine-to-five go by quicker. Think about it as entertainment even your boss would love. The best of our daily blog gets put into our monthly magazine, which you can subscribe to and receive straight to your email inbox, to be sure you’re the first in line for our promotions and prizes. Lunch Break is to be enjoyed over a sandwich – featuring lunch ideas, office fashion, celebrity gossip, events for your calendar and gym class reviews. The publisher, Intelligent Media Solutions (IMS) is a dynamic company involved in magazine publishing, contract publishing, new media and marketing solutions. We deliver successful magazines through print and online publishing for a wide range of niche (and not so niche!) reading communities. All our content is fast, focused and bang on remit, making it a must read. We write magazines for passionate and forward-thinking audiences. Interested in advertising? Download the Olé Media Pack to learn more about the magazine, its readers and all associated promotional opportunities.